I have noticed some impatience in the press, based upon the assumption of a so-called soft policy in Japan. This can only arise from an erroneous concept of what is occurring. The first phase of the occupation must of necessity be based on military considerations which involved the deployment forward of our troops and the disarming and demobilization of the enemy. This is coupled with the paramount consideration of withdrawing our former prisoners of war and war internees from internment camps and evacuating them to their homes. Safety and security require that all of the steps shall proceed with precision and completeness, lest calamity may be precipitated. The military phase is proceeding in an entirely satisfactory way. Over half of the enemy’s force in Japan proper is now demobilized and the entire program will be practically complete by the middle of October. During this interval of time, safety and complete security must be assured. When the first phase is completed, other phases as provided in the surrender terms will infallibly follow. No one need have any doubt about the prompt, complete, entire fulfillment of the terms of surrender. The process, however, takes time. It is well understandable that in the face of atrocities committed by the enemy there should be impatience. This natural impulse, however, should be tempered by the fact that security and military expediency still require an exercise of some restraint. 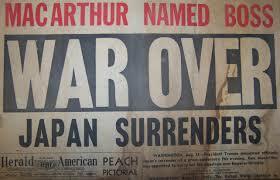 The surrender terms aren’t soft and they won’t be applied in kid-glove fashion.